GLASG is one of more than 5,000 organizations on LibraryThing. GLASG is listed as a "guild." 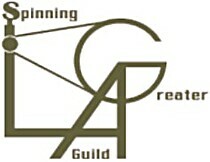 About meThe Greater Los Angeles Spinning Guild is a friendly group of spinners in the L.A. area. Our members come to spinning from a variety of fiber arts: knitting, weaving, rug-making, felting and more. About my libraryOur library commenced in the early 1980's just shortly after our guild was formed. Our books have been donated by members and vendors. A large portion of our books were donated from the library of Mary Frances Eves.